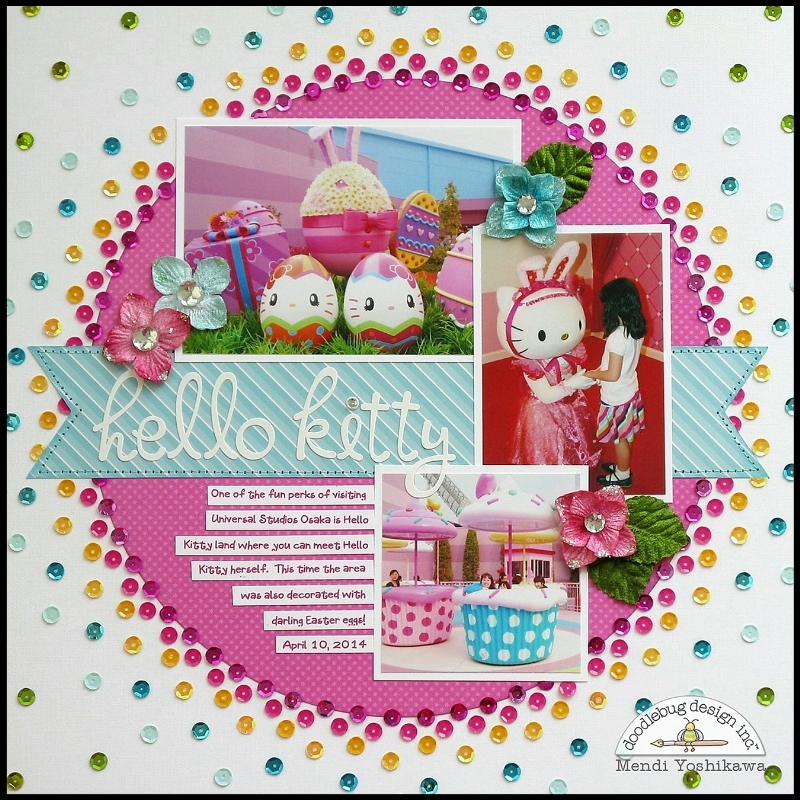 Sequins are so versatile that you can use them as the "featured" embellishment on your layouts like Mendi did on her layout below. Or you can simply use them to add a little extra blingy accent to your stickers, paper design and other embellishments. We hope you like theses two inspiring ideas. It's Mendi here and I'm excited to be sharing a layout featuring Doodlebug's SEQUINS! I'm sure I'm not alone when I say I am in love with these. There are so many fun ways you can use them and I love that Doodlebug's bottles come in so many colors with so many variations within each bottle! I thought for my layout it would be fun to create a radiating design where the sequins started out more tightly placed and then got further apart as they move away from the circle. To achieve this I started by adhering the bubble gum sequins about 3/16" apart (I just eyed it) along my die cut circle using Ranger's Glossy Accents. I found that this adhesive worked well and was easy to apply in small amounts as I went. I also discover after it dried I could easily flick off the beads of glue that oozed through the hole of some of the sequins. As I progressed I just slowly set them further apart as I moved outward. To complete my layout and create my visual triangle, I embellished with some Velvet Hydrangea flowers by Petaloo and topped them with Lily White Jewels. Hey everyone! Candace here from Scrappin' 2 Little Princesses and today I am sharing a layout and a fun way to add sequins to your projects! I love the glimmer that sequins add to a layout and one of my favorite places to add them is onto patterned paper. On this layout, I choose a few colors of sequins that matched my background paper and adhered them to the centers of the flowers with Glossy Accents. 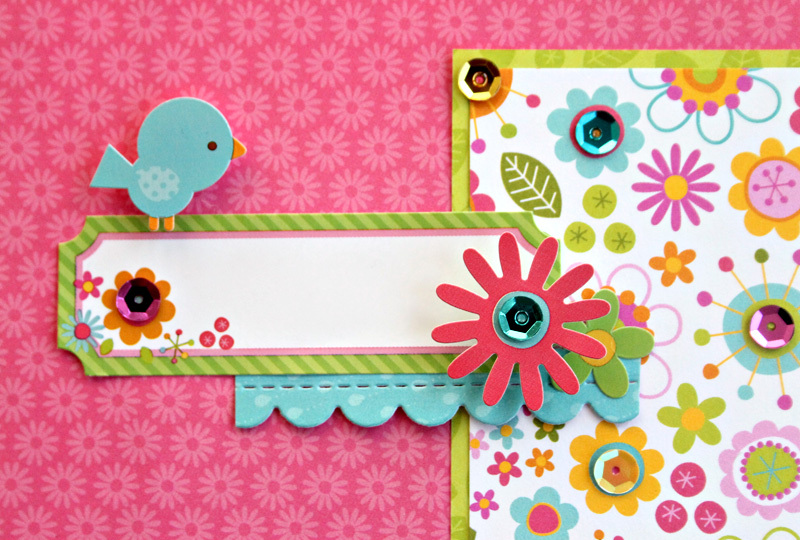 Of course the collection I choose to work with was Springtime because I am so in love with all the fun bright colors and cute little birds! My favorite thing about Doodlebug sequins is that there is a variety of shades/finishes in each color which makes it so easy to pick out the sequins that match each project perfectly. The Springtime collection is so sweet and darling on its own but I love the added sparkle and texture the sequins have added! 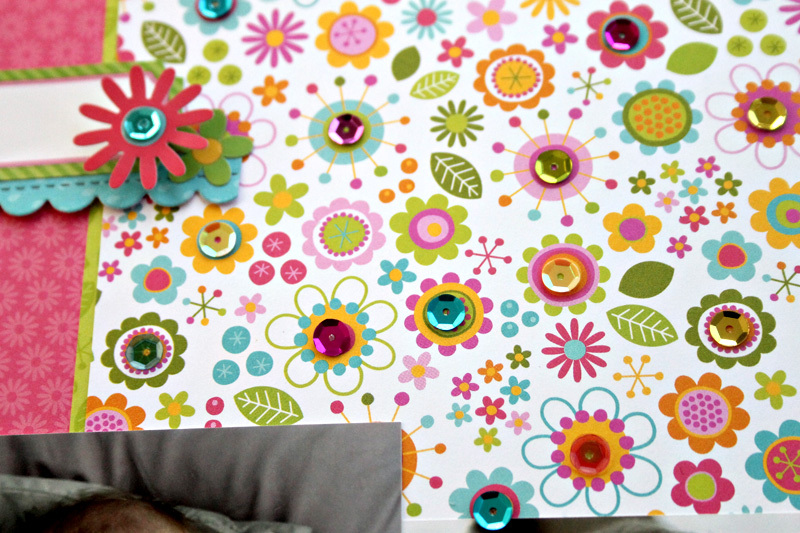 Using sequins on polka dot paper would have another fun effect! Thanks for stopping by today! I hope I have inspired you to get out your sequins! These are both so adorable!!!!! 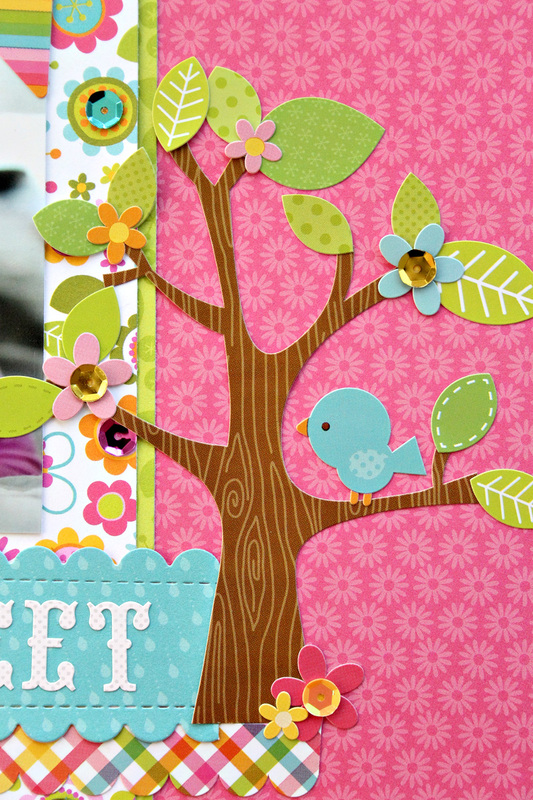 These layouts are beautiful and sweet! The use if sequins is impecable! Thanks for such great inspiration! Both of these pages are adorable. 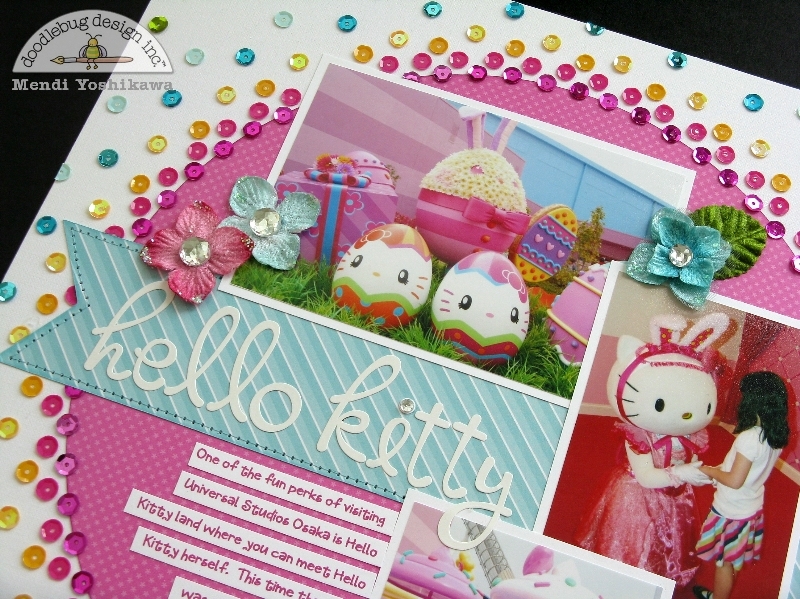 I have to say Mendi's page with the radiating sequins is a real KNOCKout!! Beautiful design idea!! LOVE your round mat and rings of sequins framing it Mendi!!! 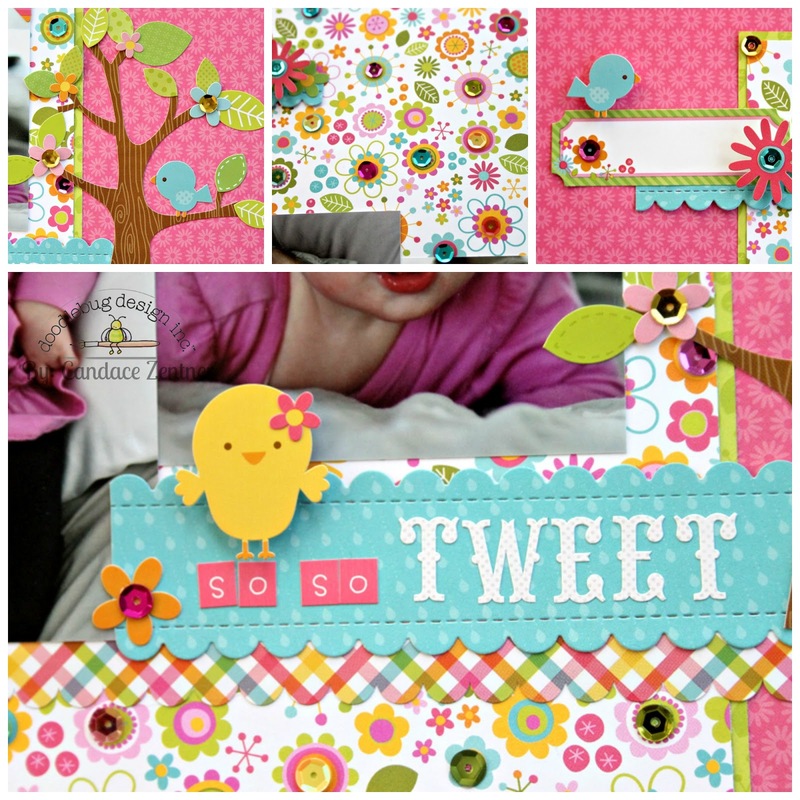 LOVE your sweet, tweet layout Candace, the sequins really make the flowers POP and add such bright shine!!! 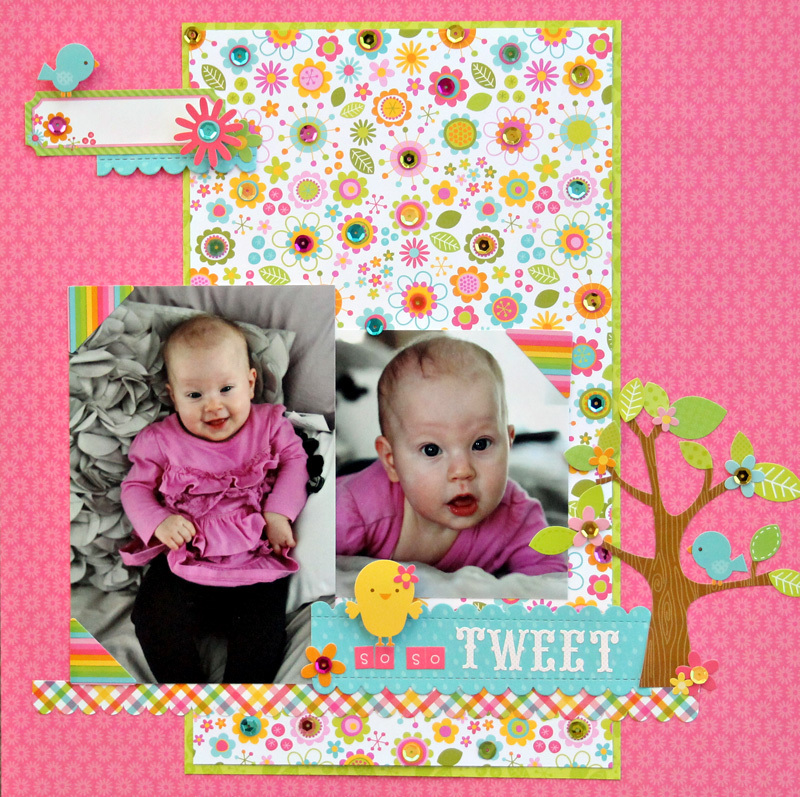 Adorable layouts!! 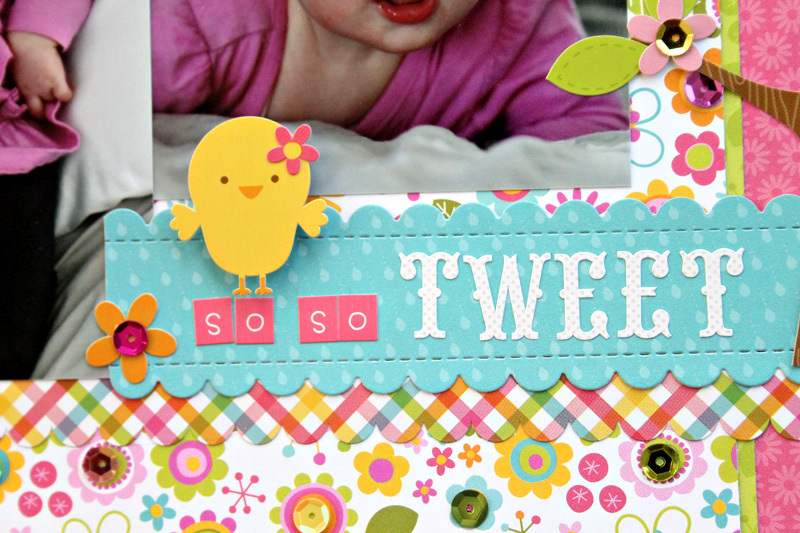 I love the way Mendi has arranged the sequins on her layout - I pinned it to my "Layouts I Love" board! Oh my gosh Mendi - you have TONS more patience then I ever would to attach all those sequins just so. Way to go! Mendi and Candace totally rocked the sequins on these superb layouts!! I am always amazed to learn new things from all of you! !